Financially supporting a fire house is no easy task. Many departments must resort to unconventional ways of securing funding to supply their crews with the proper gear needed to keep them protected. That's why financial decisions must be considered carefully. Jennings Volunteer Fire Department (JVFD) is no exception. Located in rural Jennings, Oklahoma, the department serves a town that measures 96 square miles, and like many small departments, they rely heavily on grants and community support. To help raise money for the department, the community hosts an annual car show in July. This year, they successfully brought in 70 car entries, including a 1966 red Mustang donated by Chief Bobby Halton. 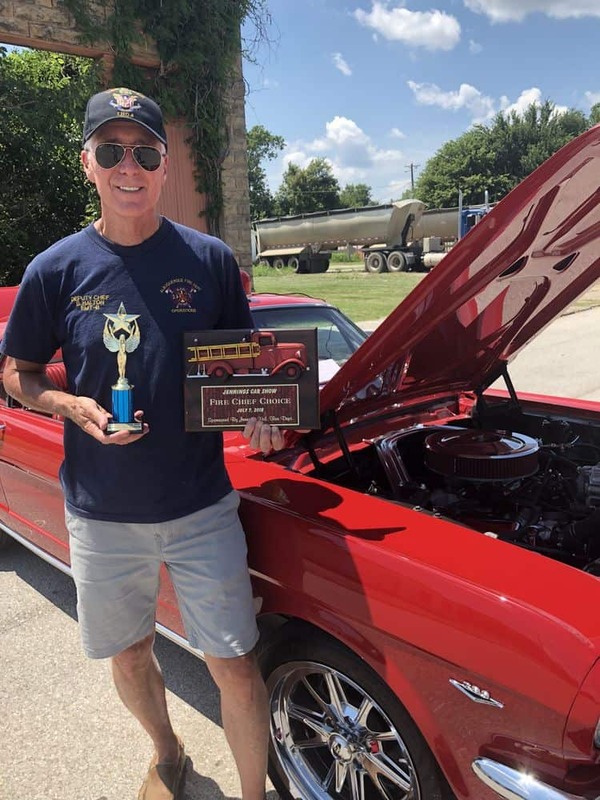 Chief Bobby Halton and his 1966 Mustang. With its earnings, the department was determined to upgrade their current gear and offer their crews the best health and safety-focused personal protective equipment (PPE) within budget. Their decision led to the purchase of Fire-Dex's Interceptor Package™ , a bundle including structural turnouts, firefighter fatigues, and a particulate blocking hood. "The Interceptor Package allowed us to use our budget in a more resourceful way, saving our structural gear for the right calls," explained Chief David Poulter. "We were using our structural gear way too much and it is not designed for that." 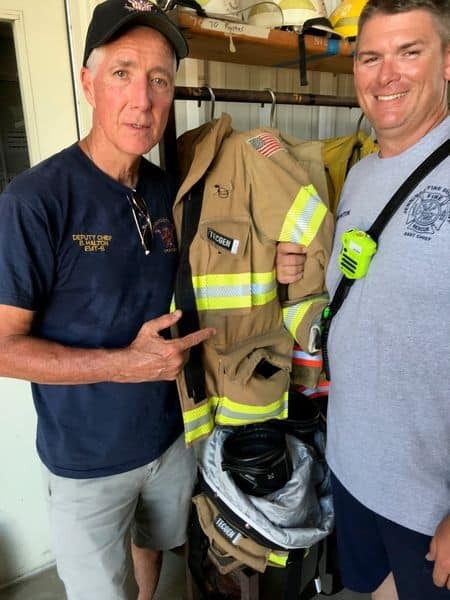 Assistant Chief Keith Buntin (pictured to the right with Chief Bobby Halton) stressed the importance of particulate blocking hoods in this package, stating that the H41 Interceptor™ Hood prevented "that layer of gunk on my skin after a fire." While their budget didn't allow for every crew member of the department to have their own Interceptor Package™ , they still felt this was the best and safest option for their team. "I couldn't believe how light it was and I wasn't even getting hot." JVFD shares their PPE within their department, as well as 12 other neighboring communities. The Interceptor Package™ allows the department to give that much more to its crew, as well as their neighbors in time of need. Fire-Dex recognizes any department can experience financial struggles and has partnered with FireGrantsHelp to provide grant assistance to departments just like JVFD. Apply for grant assistance here.